Beautiful framed print will look great in your home, office or anywhere you choose. 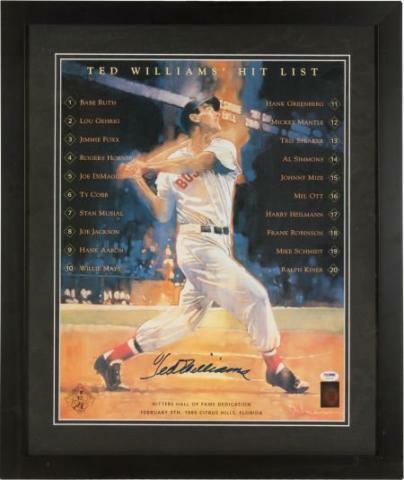 This Ted Williams Signed Oversized Print is a stunning piece featuring Red Sox legend Ted Williams, and signed by "Teddy Baseball" in blue marker. The signature is rated "Mint." This handsome piece is framed and matted, and measures 20" x 26". This wonderful tribute, signed by one of the game's greatest players, includes a Certificate of Authenticity from PSA/DNA, and GREEN DIAMOND. Due to the special of this offer we will charge your credit card for the full price immediately upon taking your order. This policy ensures we reserve the item for you. We will confirm your order by Email. Please allow at least 2 weeks for delivery. 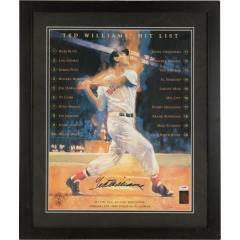 Ted Williams Signed Oversized Print $695.00 Sold Out!